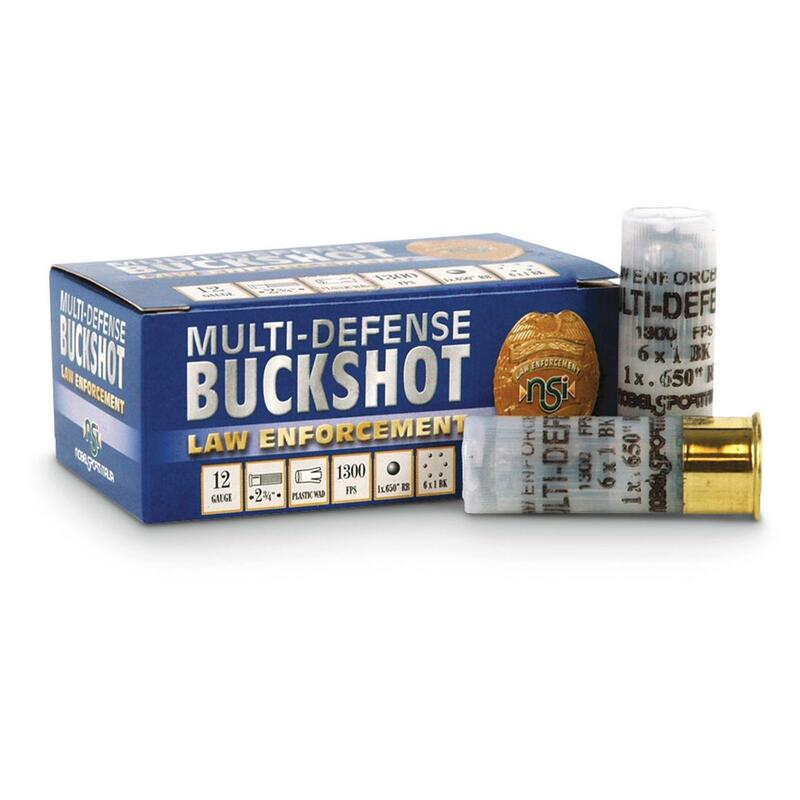 These 12-gauge plastic-wad Shells are loaded with a single .650 size pellet, along with six buckshot pellets, for a hard-hitting 1-2 punch of stopping power. Premium made in Italy, count on these shells for personal defense. 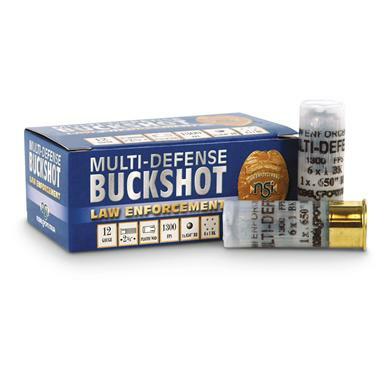 Muliti-Defense, Law Enforcement, 12 Gauge, 23/4 , Buckshot, 100 Rounds is rated 4.9 out of 5 by 28. Rated 5 out of 5 by TJB1954 from Clean shooting ,Hard hitting great product! Rated 5 out of 5 by Shotgun from GREAT PRODUCT!! Great round- Impressive impact . I carry a bird round in the first position, then a mix of defense rounds and buckshot. This will provide for dangerous critters. Rated 4 out of 5 by The KId from Great home defense These shells are awesome looking. Have not used any yet . Just building some inventory. Rated 5 out of 5 by Todd A from Great round Decent price for a great shotgun defense round. Not the first round in my gun for in home defense because of wall penetration ( don't plan on missing plans alter at first contact)but anywhere else, totally effective. Rated 5 out of 5 by DONALD T. from I bought similar rounds made from a different company and couldn't get it anymore. I was happy to see that you carry this product. Now my inventory has increased. Rated 5 out of 5 by MICHAEL from Great product. Rated 5 out of 5 by BRYAN from Great product with an excellent shot pattern. Rated 5 out of 5 by PAULA from These are a perfect home defense shell. 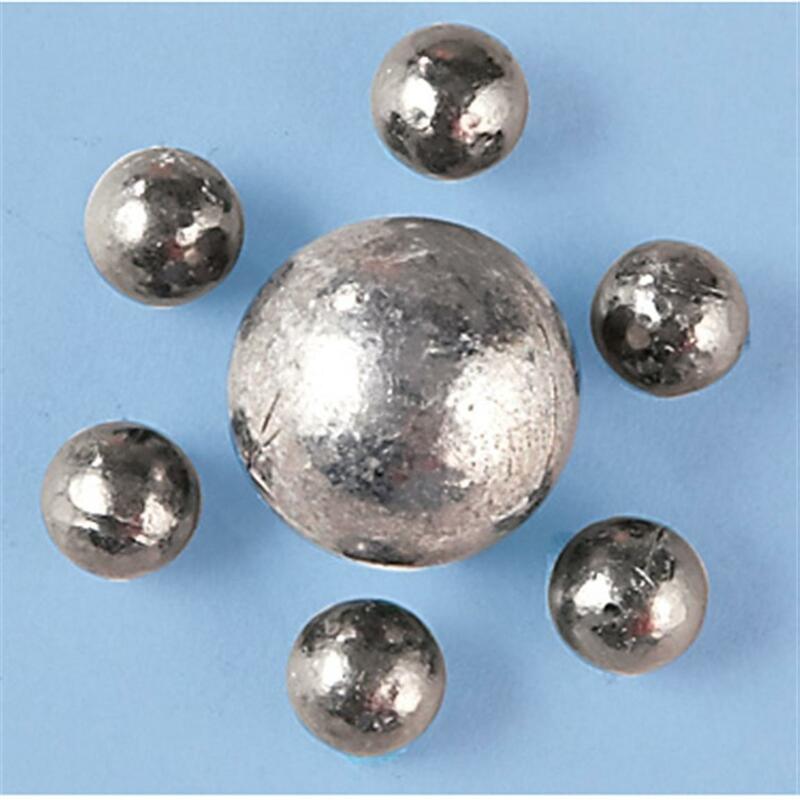 100 rounds Sellier & Bellot 12 Gauge 3"
Fiocchi Exacta Nickel-plated Buchskot, 12 Gauge, 2 3/4"
A deadly pattern of stopping power.